It is the fortune-teller who changes your life… she says that you will marry a sailor. You will have five children and live beside a big forest... in a cabin surrounded by a picket fence. Author and artist Ursula Banke was 12-years-old when she first heard the fortune-teller’s prediction. Seeking that promise led her to create her own Robinson Crusoe lifestyle – as an off-grid homesteader on Beck Island with her husband, Carl and raising their two (not 5) children. 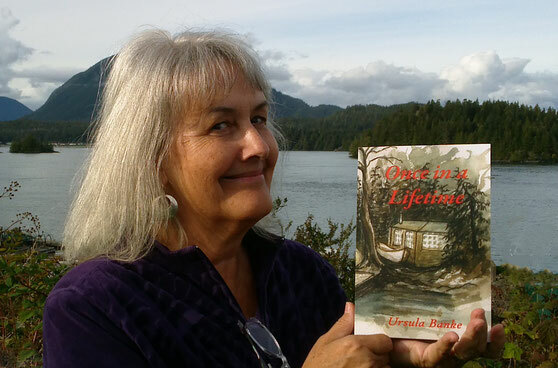 Banke wrote the story about their uniquely lived life and in the fall of 2015, launched her memoir, Once in a Lifetime. The memoir is narrated by the omniscient presence of her grandmother, Iffi, who died long before Banke was born, but with whom she formed a relationship through the process of the writing. “Once I adopted my grandmother as narrator… the writing came relatively easy,” said Banke, who, now a grandmother herself, penned the memoir to create a legacy for her own grandchildren. Once in a Lifetime includes all the high adventure of island living that you would expect: from idyllic family boat trips, camping on the beach at Crazy Eagle Bay; to the perils of wild animal encounters, chimney fires, danger trees and hurricane force storms. Banke takes you with her: through the challenges of being a new wife, living off-grid while raising children and rabbits; canning fish and bottling beer. Sharing her inspiration of being an artist, singer and song writer, the book illustrates her songs and watercolour paintings. “When I first drove to Tofino in 1967, I travelled through a blackened landscape revealing the charred remains of a huge forest,” said Banke. “The trip from Port Alberni to Tofino took over 3 hours, driving around deep potholes on the gravelly switch backed logging road.” Then there were no cell phones, only citizen band radios to stay in touch with other remote homesteaders. Homesteading on an island solved the ever-present short-term rental challenges but, more importantly, it was a lifestyle choice.